3) To provide opportunities for members to make contributions to their local communities. The purpose of the SASE Scholarship Program is to recognize and reward deserving SASE Collegiate and Professional members who have demonstrated exceptional academic achievements and leadership credentials through activities and impacts they make on campus and local communities. By awarding these scholarships as financial supports, SASE helps cultivate and develop the leaders of tomorrow. SASE also recognizes diversity and celebrates it by shining a spotlight on their great work and contributions. A strong part of the evaluation criteria depends on how the applicants have contributed to their community. These scholarships advance the SASE mission. SASE Scholarship Program awarded its first scholarship in 2015. The first scholarship program was sponsored by Kellogg Company and presented at the SASE 2015 National Conference in Houston, Texas. SASE looks forward to award more educational grants to outstanding and exemplary recipients for years to come. This year SASE is proud to be able to host two separate scholarships sponsored by Kellogg Company and The Shekhar and Anu Mitra Family Fund. The Kellogg Company is honored to provide scholarship funding to the Society of Asian Scientists & Engineers because of the work the society is doing to develop current and next generation STEM talent within our communities and across our diverse populations. This year’s SASE Scholarships sponsored by Kellogg Company is to recognize select SASE collegiate members who promote STEM interest in their community through outreach activities and programs. ”Celebrating Success” is one of the Kellogg Values, and these scholarships celebrate the success that the receiving candidates have exhibited through their studies and activities. Enrolled full-time in an accredited undergraduate program at a SASE affiliated college/university and a collegiate member of SASE in the 2017-2018 academic year. Currently pursuing a B.S degree in a field related to Engineering or Biological Science, including, but not limited to Engineering in Mechanical, Chemical, Biosystems, Electrical, Industrial or Civil; plus Food Science, Chemistry, and Biology or BioChemistry. Cumulative Grade Point Average of 3.0 or higher on 4.0 scale. Must be a U.S Citizen, national or legal permanent resident of the United States. Previous SASE Scholarships Recipients are not eligible to reapply to the Kellogg’s Scholarship. Individuals will be selected based on their attributes of leadership, integrity, and perseverance. Two undergraduate students will be selected to receive a $1,000 scholarship to be used toward tuition, books, and/or living expenses. The scholarships will be awarded directly to the recipients. For consideration of a SASE Scholarship sponsored by Kellogg Company, all applicants must complete and submit the application materials online. All supporting documents and the online application must be submitted by 11:59 PM PST on May 26, 2018. Selected recipients will be notified by June 9 , 2018. All scholarships will be officially awarded at the 2018 SASE National Conference in Schaumburg, Illinois. In addition, each scholarship recipient will be featured in the 2018 SASE National Conference Magazine and SASE National Website. The Shekhar and Anu Mitra Family Fund is honored to provide scholarship funding to the Society of Asian Scientists and Engineers to award those who exhibit volunteerism and leadership within SASE and their community. The Shekhar and Anu MItra family believe that volunteerism and leadership go hand-in-hand and without its hardworking volunteers, SASE would not be where it is today. Individuals will be selected based on their attributes of leadership and volunteerism integrity. The $1,000 scholarships will be awarded directly to the recipients. The following scholarships will be awarded: one undergraduate scholarship,three graduate scholarships, and two professional scholarships. For consideration of a SASE Scholarship sponsored by The Shekhar and Anu Mitra Family Fund all applicants must complete and submit the application materials online. All supporting documents and the online application must be submitted by 11:59 PM PST on May 26, 2018. Selected recipients will be notified by June 9, 2018. All scholarships will be officially awarded at the 2018 SASE National Conference in Schaumburg, Illinois. In addition, each scholarship recipient will be featured in the 2018 SASE National Conference Magazine and SASE National Website. Please visit Application Details for detail requirements on application information. A sample of the 2017 application in PDF is available for preview. Please note that this is a sample application and is being provided for informational purposes only. Please do not print or submit. 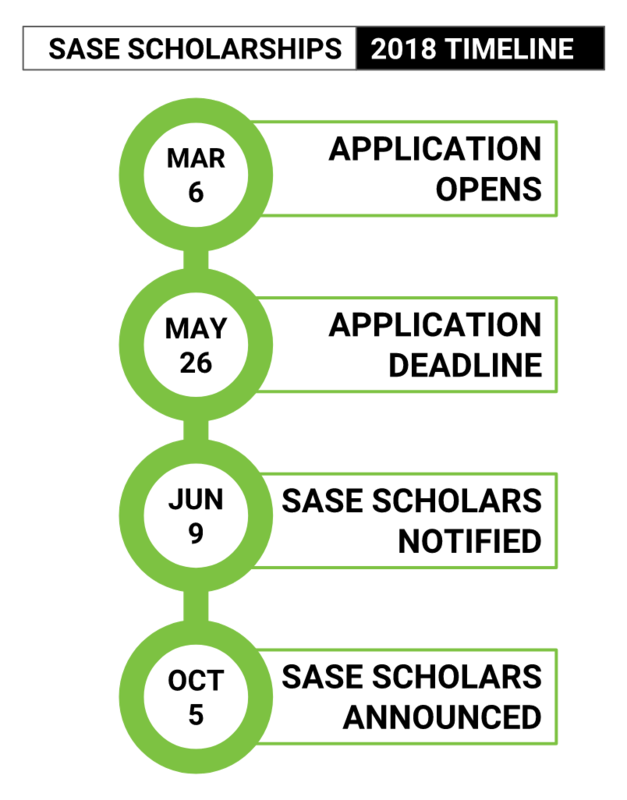 The SASE Scholarship Program Application can only be found through logging in via SASE Member Login and must be submitted online during the specified application period.